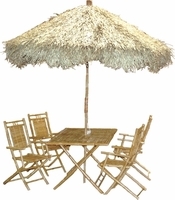 Handcrafted with high-quality woven bamboo, this bamboo table set is tightly woven with an authentic umbrella thatch. This authentic bamboo furniture is great commercial grade for both home and business. This is a eco friendly natural product that is fumigated and treated for indoor and outdoor use.